Stagecoach offer fantastic value travel to students of local schools, colleges and universities in the local area with our termrider and unirider tickets. Jenny retires after 53 years of loyal service. Colleagues of a long standing Aldershot travel shop administrator have shown their appreciation for her incredible 53 years' service, as she heads into retirement. Qatar Goodwood Festival (Glorious Goodwood) returns for 2017! 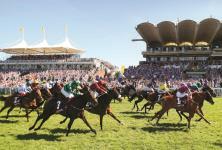 Services will run from Chichester Railway Station to Goodwood Racecourse from Tuesday 1 August to Saturday 5th August.